I don't know if it is a good or bad thing that its Friday's 5 and not 12 or 20 or 52. I had quite a hard time going through each month and only coming up with 5 recipes to pick. I actually only got through 1/2 the year. I basically have enough meals to remake to cover all dinners for the whole month of January. I am not going to mention the desserts. I wasn't really even taking those into consideration for this posting. I have Asian cuisine on my mind now and am thinking that will be our New Year's dinner. Enjoy these recipes and I am wishing you the very best New Year! Leave it to me to get sick during my break. I woke up yesterday morning with a stuffed nose and a very sore throat. Lucky for me, regardless of how old I am, I have two parents that will do just about anything to make me feel better. Years ago I got my dad a cookbook called Dad's Own Cookbook. It came with blue apron, spoon and of course the cookbook. Although somewhat below my dad's skill level in the kitchen this book had several really good recipes that were immediately added to our dinner repertoire. The real find though was the New England Clam Chowder recipe. At the time he received this book we were living in Iowa and each time we ate this chowder we were transported back to Maine. Over the years he has perfected the recipe with little tweaks here and there. It is now divinely wonderful. So good that I for one have trouble ordering clam chowder at restaurants knowing that it probably will not be as good as my dad's. 1. Place a small frying pan on medium heat and let it get hot. Add bacon and cook until crisp. Remove slices to cool and break into small pieces. 2. Put 1 Tbsp of bacon fat into a large stockpot and heat pan on medium heat. Add the chopped onion and saute, stirring often till soft. Add the potatoes, bacon pieces, clam juice, and 1 C of water and bring to a boil. Cover and reduce heat to a simmer for 10 minutes. 3. Increase heat to medium and add the clams and juice. Add milk and half and half and bring to a boil. Immediately reduce heat and simmer for 5 minutes. 4. In a small bowl mix together butter and flour until completely combined. Add to soup mix and stir until chowder becomes thick. Add salt and pepper to taste. Let the chowder come to a boil one more time, then remove it from the heat. Serve hot and topped with parsley and oyster crackers. My mom's secret get well trick is a spoonful forkful of lobster. Hopefully both will do the trick and I will be back to my normal self tomorrow. Are you up yet? I was thinking before this break that I would be able to sleep through till 7am. For me this would be extremely late. I have proceeded to wake up before 6am everyday. I think something might be wrong with my internal clock. Do you know how to fix it? Christmas morning was one thing; I was ready for the presents. Now I would like to be able to sleep a bit later. On the bright side my early morning wake ups have led to some yummy desserts breakfasts. Cream shortening. Add salt and sugar gradually and mix together. Add egg and beat well. Add milk and combine. Sift dry ingredients and add to wet mixture gradually. Batter will be stiff. Place into greased 9 by 9 pan. Combine all of the topping ingredients together with a pastry blender. When it becomes a course mix, pour over batter. This is another Christmas tradition that seems to never go away. The boys always like the eggs and bacon option but for me it is coffee cake all of the way. I am on vacation till next Monday. That means for me the treats are going to keep on coming till then. If you are looking for something savory, healthy, you might want to check back next week. I am sure by then I will have had my full of sweet desserts. Come January the return of meatless Mondays and no wine with dinner will have arrived. This week though Rum Cake is on the menu. We first sampled this treat as a gift from one of my Dad's co-workers. We raved about it being so delicious she pretty easily handed over the recipe. Since then, we have been enjoying this cake every Christmas. 1. Heat oven to 350 degrees. Flour a bundt cake pan. 2. Mix all ingredients on medium speed for 3 minutes. Pour into bundt pan and bake for 50-60 minutes. Optional: you can place 1C chopped pecans or walnuts in bottom of pan before you pour in the batter for an extra treat. I was a little surprised to see this gigantic bottle of booze in the cabinet. Combine ingredients in saucepan and melt down. Bring to a boil for 3 minutes. Pour hot liquid over the cake and let soak in bundt pan for 1 hour. After an hour remove cake from pan. The cake keeps for a week. The rum soaks in more and more so its great to make in advance, however once the aroma hits your face you will be hard pressed not to just dig right in. One of the coolest things I have ever received was a subscription to Foodzie.com. You can order monthly food sampling boxes or one of their special selections featuring local artisan food purveyors across the country. I got my first try at this last Valentine's Day from Mr. J. For a few months we got a box in the mail with 5 or 6 samples of food ranging from sweets to savory and everything in between. I think Mr. J liked it just as much as I did. This year one of the things on our Christmas list was another subscriptions. Lucky for me us, we got one from my brother and his wife. Double lucky is it came early. We got the December box and it was stuffed full of sweet stocking stuffers from all of the favorites of the past year. I, of course, had no need to wait. We both dug right in. Handmade European style cookies - a delicate layer of well-caramelized almonds slathered with bittersweet chocolate. Sweet and tangy superfood combo of blueberry and acai. I don't even like gummies but I found myself popping these non-stop. Good thing the samples are instant portion control. This mouth coating buttery richness lingers on the palate long after the candy has dissolved. A blend of roasted nuts that are then folded into a caramelized mix of sweet butter, cane sugar, and brown rice syrup. Sunflower butter makes a great substitute for peanut butter. Yum! Infused with a spoonful of California wildflower honey, dark Guittard chocolate and a sprinkle of flaky sea salt, these vibrant caramels offer a whole new flavor experience. Even though every dentist is probably cringing at all of the sugar consumed by us from these samples, we are smilingly happily. And we still have our teeth. It was the first one and already we are excited for the next. Thanks Neal and Beth! Yesterday was the shortest day of the year. It was dark when I left for work in the morning and dark at night when I returned home. I hate the dark. We made some super hot nachos for dinner. I had a glass of wine. I settled in for a movie. There was no cell phone, no email, and no internet. Although I love blogging and checking out what everyone else is doing after a week of 10 hour work days with non-stop staring at the computer, I needed a rest. Thus my post today is a repeat. It's been a tradition for years now to make peppermint bark. It is a favorite of my mom. Every year I see the stuff in stores easily going for $19.99/lb and I laugh. It is so simple to make and can easily be done with three ingredients. This year it hasn't happened yet but come Saturday this is definitely on the agenda. This weekend was one big moment of indecisiveness. Normally I make a decision and go with it. Some times that works out better than other times. I feel like even if I have a wrong decision, I know what I am dealing with and can work towards a solution. Not having a direction/answer/progress is incredibly frustrating. I wanted to clean out the fridge. We had nights with very limited time for preparations. I was trying to cut costs. I wanted something light in preparation for more holiday goodies sure to come. By Sunday, I was at my second grocery store. Normally the grocery store soothes me but the jingle belling outside of every door and the massive amounts of crowds that seemingly never go into a store till this time of year were starting to get to me. I was in the meat department trying to find some ground beef for a new burger recipe I want to try out and couldn't find a package sized less than 1.33LBs. The prices was also $5.99/LB. Where was TJ's when I need them? Then my eyes hit the meal ball mixture. A little pork, veal, and beef later I had our dinner plans. 1. Heat oven to 375 degrees. Prepare a baking dish with a bit of spray oil on the bottom. 2. Mix all ingredients together except the bread crumbs and Parmesan cheese in a medium bowl. You don't want to over work the mixture so once all the ingredients are just starting to come together add the bread crumbs and Parmesan cheese. 3. Once incorporated, roll into individual balls about 1 inch in diameter. 4. Bake for approximately 20 minutes. The balls will just start to brown. 5. Serve with pasta of your choice and sauce. Our sauce was a mix of crushed tomatoes and diced fire-roasted tomatoes. I might not have hit the "light" factor I was going for but these hit the spot. We had plenty of leftovers and enjoyed this dish for lunch several times over. Meatballs can be frozen once baked for later use. Last week I had a Christmas party to attend and it was requested that I bring an appetizer. This was during the same time I was up to my ears in cookies. Nothing sounded better than something savory. I am was still super busy at work and needed something that I could be proud to share but would not take up much of my precious Saturday free time. I had collected my fair share of holiday magazines this year. Although I don't spend too much time on any given magazine I do look at every.single.page. Including the advertisements. The Crescent Roll and Puff Pastry adds had drool dripping from my mouth while I ran. (Think about it, everyone just thinks it is sweat. Its the perfect time to ogle food.) Pilsbury makes a special tube of Crescent Roll dough that is not cut out into triangles. This literally allows you to create anything. My first option was super easy. Much to Mr. J's dismay I needed a meatless option. I simply rolled out the Crescent dough a bit bigger and topped with store bought pesto and shredded mozzarella cheese. Roll up like a cinnamon roll and then carefully cut the roll into slices about 1/2 inch thick. Lay flat on the baking sheet. Bake for 10 minutes at 350 degrees till the cheese begins to melt and the dough turns brown. Eat immediately. If you are bringing to a party like I did you can leave unbaked in the fridge till right before you leave, then bake or you can pop them into the oven for 5 minutes to reheat before serving. The second option, a take on jalapeno poppers, took a bit more time but it was well worth it. Mr. J helped fry up some bacon and slice fresh jalapenos into thin strips. Once the bacon is cool crumble the strips into small bits. Again I rolled out the dough to make the large piece a bit bigger. Using a pizza cutter I cut the large rectangle into 16 smaller squares. In the center of each square place a glob of cream cheese. ( I was going to use Boursin cheese but Mr. J ate it all.) Place one or two pieces of bacon along with two or three strips of jalapenos on top of the cheese. Fold corners over to make a little pocket. You can "close" of the wraps any way you see fit. We ended up with quite an assortment of shapes. Bake for 10 minutes at 350 degrees. They are good, real good. They were a huge hit at the party and were completely gone before everyone arrived. I can imagine serving with soup at dinner or even just having as a light meal. Not something I want to get in the habit of but oh the possibilities. Having a husband is hard work. Just when you think you are doing a good job he throws something at you like Chocolate Crinkle Cookies. It was shortly after Thanksgiving that we were discussing food possibilities for Christmas dinner as well as the annual Christmas cookie bake off. We had a list of about 15 different cookies going and we were just about to end when Mr. J spoke of these Chocolate Crinkle Cookies. He wanted some. My mom immediately jumped in to say that she liked them too and they must be added. She will have anything chocolate but really we did NOT have such a thing growing up. I think she was secretly keeping them from my brother and I all of these years. Since that conversation I have seen not only Chocolate Crinkle Cookie recipes across the Internet but Peppermint Chocolate Crinkle Cookie, S'mores Chocolate Crinkle Cookie, and Mocha Chocolate Crinkle Cookie. Yum, right? Good thing Mr. J is a simple cookie man. The originals were fine with him. Place the chocolate and oil in a small saucepan over low heat, stirring occasionally until the chocolate has melted and the mixture is smooth, about 4 minutes. Remove from the heat and set aside to cool slightly. Sift together the flour, baking powder, and salt into a medium bowl; set aside. Place the sugar and the chocolate-oil mixture in the bowl of a stand mixer fitted with a paddle attachment and mix on medium speed until combined (the texture will be sandy), about 2 minutes. Stop the mixer and scrape down the sides of the bowl and the paddle with a rubber spatula. Return the mixer to medium speed and add the vanilla and the eggs 1 at a time, letting each completely incorporate before adding the next, about 2 1/2 minutes total. Stop the mixer and scrape down the sides of the bowl and the paddle. On low speed, add the flour mixture and mix until just incorporated, stopping once to scrape down the sides of the bowl and paddle, about 1 minute total. (The dough will be runny like batter.) Scrape down the sides of the bowl and cover with plastic wrap. Refrigerate the dough until firm, at least 2 hours or overnight. Heat the oven to 350 degrees and arrange 2 racks to divide the oven into thirds. Line 2 baking sheets; set aside. Bake for 5 minutes, then rotate the sheets front to back and top to bottom and continue baking until the edges of the cookies are set but the tops are still a little soft, about 5 minutes more for soft, chewy cookies or 7 minutes more for crisp cookies. Transfer the cookies to a wire rack and cool completely. Let the baking sheets cool completely before repeating with the remaining dough. The cookies can be stored in an airtight container for 3 to 4 days. The cookies took a bit of time to prepare. I kind of forgot about the whole refrigerate the dough for a few hours before baking. The end results were some really big cookies. I am really hoping to get a smaller cookie scoop for Christmas. The big cookies though was a very good thing because they are delicious. I think they taste like a lighter brownie but the kind on the edge of the pan due to the crispy outer shell. I typically try to avoid most things with powdered sugar and cocoa because they are difficult to work with. I tend to end up with both all over me and the kitchen. I have nightmares about blowing my nose and all that comes out is cocoa. Sorry for that picture. This was just a trial run. The dough refrigerates for about 3 day but can also be frozen once the cookie dough balls are formed. I plan to bake off the rest later this week to bring back for the holidays. I am glad Mr. J spoke up because I am definitely banking on this being a new cookie tradition. This is a first weekend in a long time that we had absolutely no plans. It was marvelous. On top of that I have no work trips this week. Christmas is a mere 7 days away. My first celebration is slated for December 24th and I am getting more and more anxious for it by the second hour. I may have even convinced Mr. J that a present or two should be opened before then. In my down time this weekend I did some reading. This was a great book. It was set in southern Maine. The same area where I used to spend my summers with my grandmother. They listed out places and restaurants that I have been to and it brought back so many memories. Lots of baking was also done. I honestly don't know how I am going to get rid of all of the treats but it sure was fun making everything. I think my co-workers are going to have quite a few surprises this week. We also decided to go shopping in Hartford at two shopping plazas and the big mall. I am not sure this was the best idea. The first stop was not bad and we lucked out with a parking spot within 2 minutes of pulling in. The mall was a completely different story. Hectic is a huge understatement. It took way longer to find parking and we ended up walking about 10 minutes to get in. All I can say is it took all of my might not to buy anything. I have a tendency to buy everything on my list for me before Christmas. It was so hard not to pick up a few things. Mr. J promised to bring me back after Christmas to get anything Santa forgot. 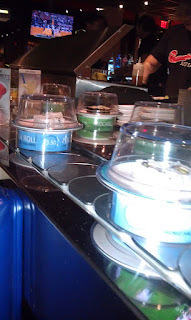 To fuel up from all of our bustling around we ended up at a conveyor belt sushi restaurant. Have you ever been to such a place? I have been wanting to try one for quite some time. I was a little worried though and kept reminding Mr. J that it was not all-you-can-eat. 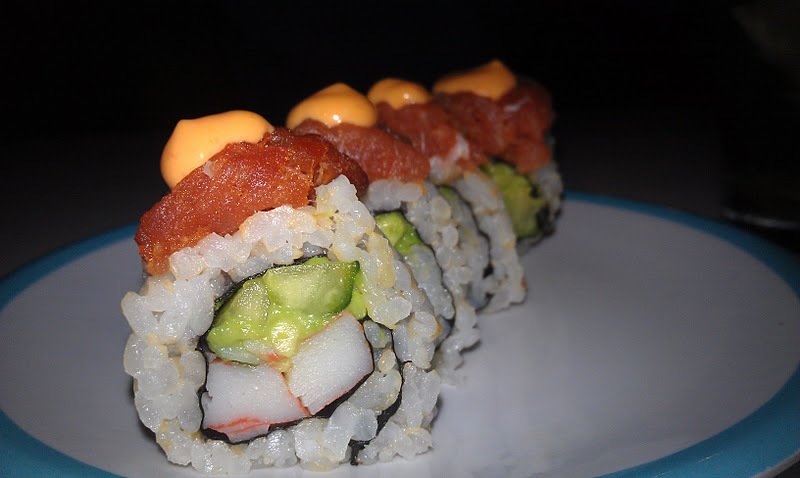 Mr. J can put away sushi like a professional eater. All of the options keep going around and around. You can take as many different rolls as you would like. At the end they count up your plates and price you by color. 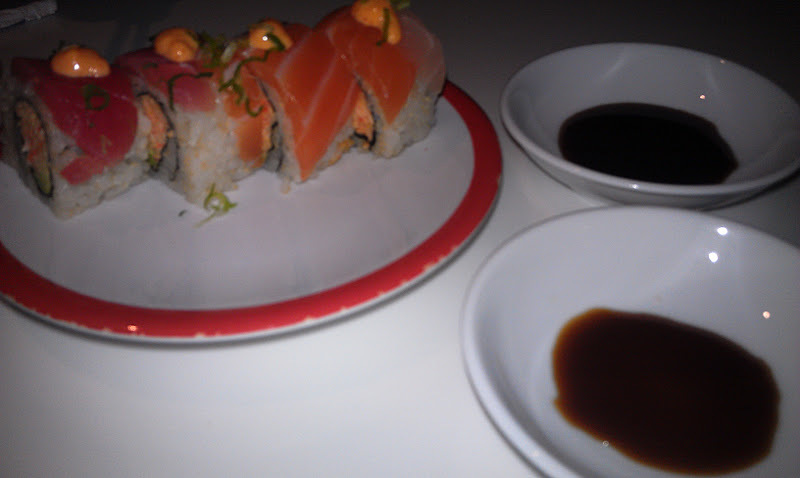 It wasn't the best sushi I ever had but it hit the spot last night. Mr. J was so focused on the plates going around we had little dialogue during dinner. I think all of the options were a bit much for him. His eyes kept darting back to the conveyor belt. I had to laugh out loud a few times. 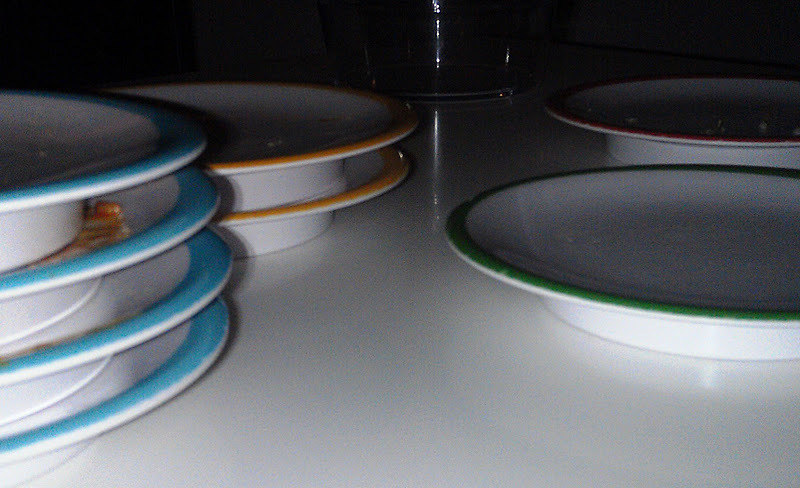 We managed to stack up quite a few plates. Mr. J said he could have doubled what he ate and still ate some more. Good thing this place isn't close. All in all it was a fun experience but definitely not fine dining. Have you ever been to conveyor belt sushi?